I think there is nothing better than going out to breakfast on a Saturday morning. My friend and I went to Pete’s Egg Nest down on Greenwood and 78th. My friend took me there once before. I had the omlette the way I have never had one before.. Round and thick like a weight you put on the end of a dumbbell. 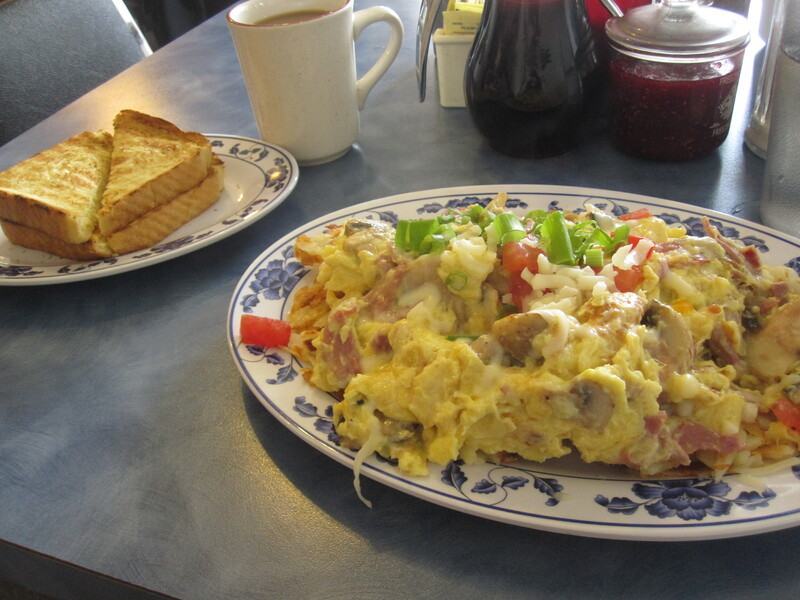 I opted for one of Pete’s famous scrambles: The New York Scramble. Corn beef, tomatoes, green onions, mozzarella but I was chicken and had him hold off the sauerkraut. Next time I swear I will try sauerkraut! This morning, I ate in celebration of friendship. One year ago today I met up and stayed with wonderful friends of mine in New York. They’re the kind of friends you can laugh at the most vile jokes together, drink, have challenging conversations and share genuine space. So this morning, I thought of my friends. I toasted to them (through eggs! ha!) 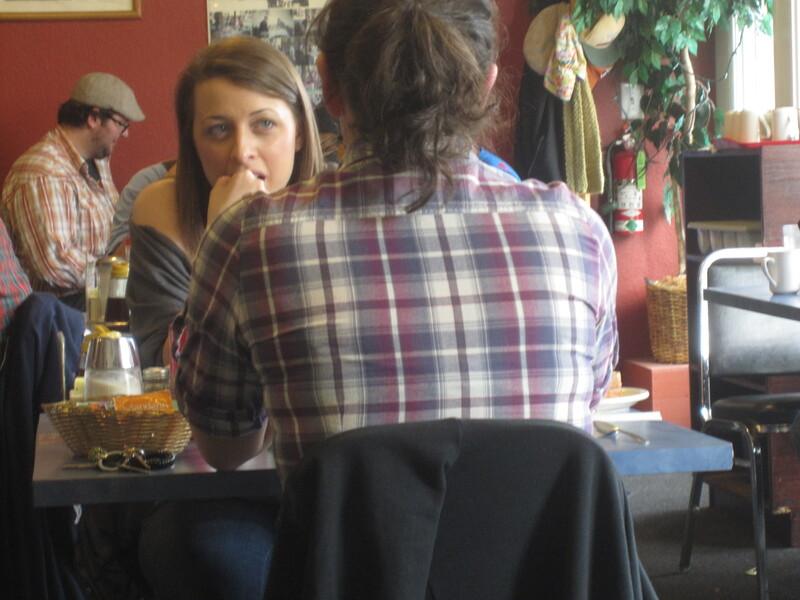 and shared more genuine space with my friend across the table. I’m a blessed girl. 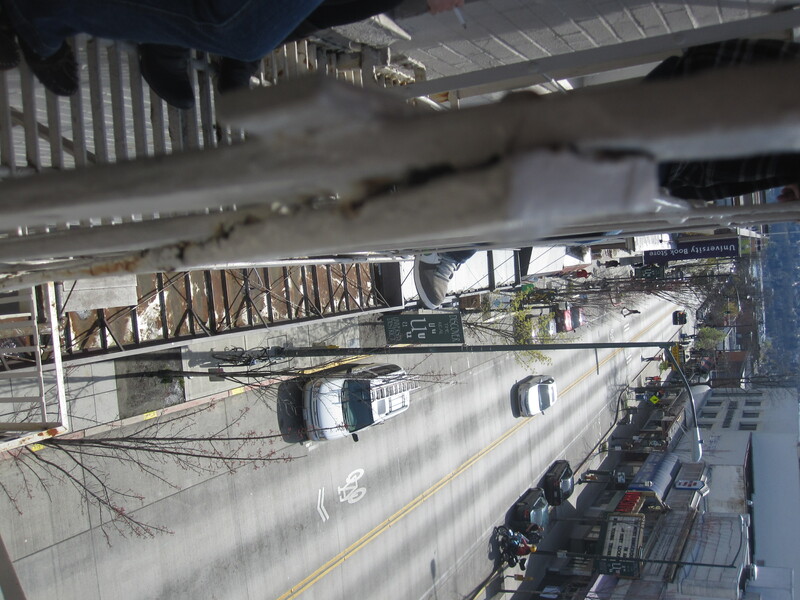 During one of my breaks at work yesterday, I sat on a fire escape for the first time in my life. I ate my nuts and dried fruit (damnit, I am such a freakin’ hippy. I keep denying it!) and my coworkers ate soup .. a granola bar. We were quiet and decided to keep conversation to a minimum.. enjoy the fresh air and the sun. 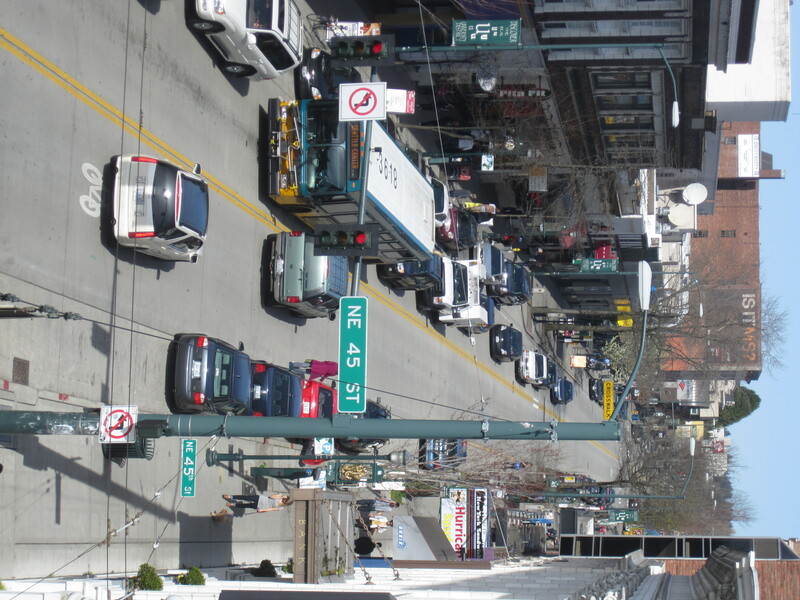 The above photo was of “The Ave.” I asked one of my co-workers, “Why is it called The Ave when the street is called ‘University Way’?” He didn’t know what to tell me. The Ave is full of chinese retaurants and coffee shops. Its close to the University of Washington, what did you expect? The crowd is a mix of goths, preps, hipsters, professionals and hippies (I’m still not sure what a “hipster” is but it seems to me like it is someone who is dressed ‘cool’. I can’t put it into words. I’ll figure it out). A native Seattlite told me that when he was in high school, it was much easier to get pot than alcohol. There was a restaurant that never policed people about smoking pot.. So he and his friends would go there to eat, hang out and smoke. He also informed me “No self-respecting U-Dub (University of Washington) student would be caught hanging out on The Ave though.” Duly noted. This new blog of yours is working out rather nicely. Vancouver is the king of hippiedom on the west coast, but I wish I knew Seattle a little better.